What to Do for Father’s Day? Hurray for Father’s Day! That special guy you owe so much to gets his time in the limelight in just two weeks, and you want to make the day special. Here are a few pieces of inspiration to help spark some ideas of how to do just that. First, the classic card. Don’t underestimate your power to please with a little bit of paper! 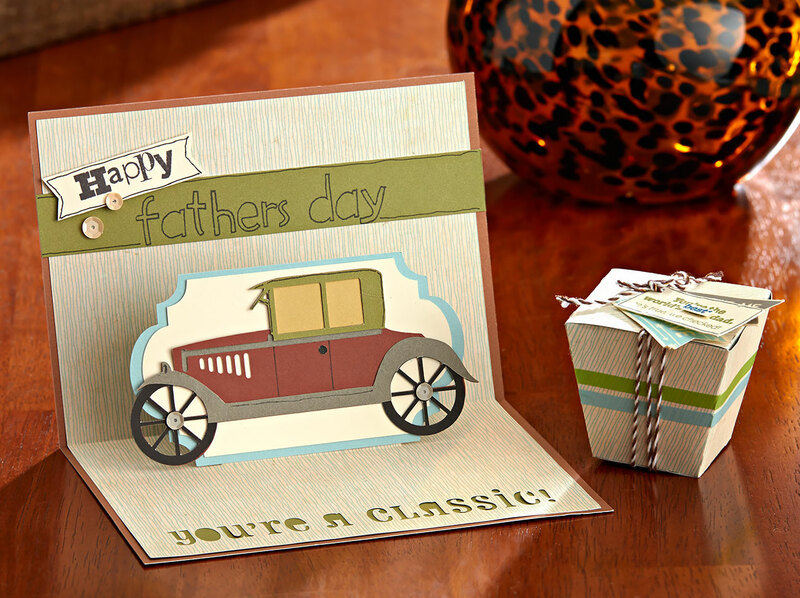 With the help of the Cricut® Artfully Sent cartridge, you’ve got loads of manly card options at your fingertips. Achieve a rustic look with the help of Jackson Background & Texture (B&T) papers or the cards from the Picture My Life™ Jackson scrapbooking program. If you have a little something extra to give dad, many of the cards on the Artfully Sent cartridge are designed to hold gift cards. All you need to do is slip a gift card for his favorite hardware store inside and watch his eyes twinkle. Another idea is to wrap his favorite treat in a box cut from the Cricut® Artiste cartridge and let his grandkids make the special delivery. The packaging will be cute, but not quite as cute as the scene of grandpa hugs, kisses, and inescapable tickling that will surely follow. For those of you not feeling that Cricut® projects are the right fit for your special guy, try a handy My Crush® For Him book instead. You can fill up each page with love and memories meant just for him. Big or small, your handmade gifts for dad will make him smile. Have fun putting your heart into something he’ll love!